Sometimes people ask me "How do you manage to always travel and climb? It must cost you loads of money..."
I always reply that you just have to be dedicated. I'm not a paid climber, so I suppose I'm not a pro. But I just try to work with the things I have. I live cheap (anti-squat it's called), I don't spent money on cinemas, weekly hairdressers or manicure or parties and drinks, when I camp I often just bivouac, and I eat healthy but simple. Rather no shower for a week and a week full of climbing then having spent money on an expensive campsite with showers and therefor having to go home early because I was out of money (or something like that). I was happy last Thursday and Friday with my perfect little bivouac-spot in the forest. How? Well let's start with... the start. After we left Friedrichshafen we spent some time in Crolles. I tasted some special beer (I never drink alcohol) enjoyed being together with Dennis again, work, bit of climbing and then I decided it was time for climbing again. Together with the Petzl Media Crew (LaFouche, Eric and Guillaume) I drove to Céuse (where else would I go) to film Daila and Chris. On my first day I found some Swedes (sweets) from Goteborg to climb with, warmed up in what appeard to be a 7c (onsight!) Equinoxe or something (just left of the Demi Lune sector) and cooled down in the beautiful 7b's on the Un Pont sur l'infini wall which I'd done a million times already because I love them all :) They were fun to climb with and we made a climbing date for Friday again. I went down, had dinner with the Petzl crew (thanks LaFouche) and went for my favourite spot (Ceüzette). The next morning was Friday. Already. So much sun, heat and just 1,5 day left to climb. I was relaxed, chilled in the sun, played some games on my phone, wished my parents good luck on their cycling trip to Rome, packed my stuff and when 'I felt like it' walked up the steep hill. He told me his granddad was Russian, thats where he got the light hair and skin colour from. We warmed up in Lapinerie (jump!) and found Ça Cartoon way harder then 7a+. 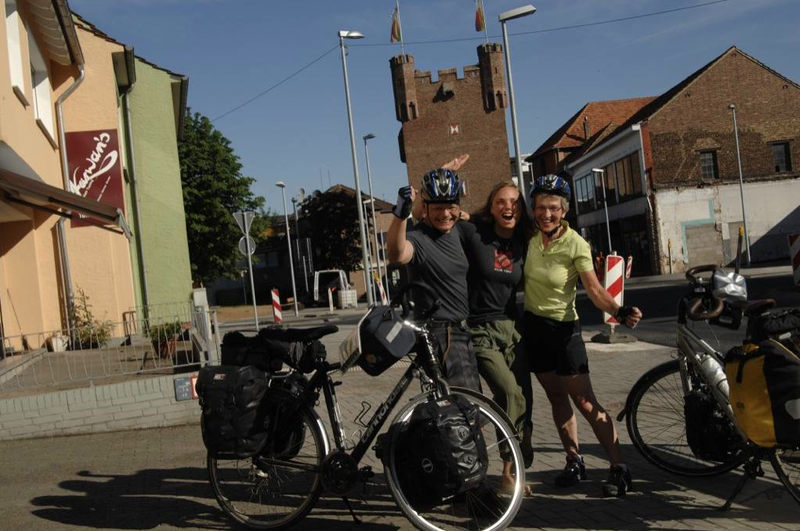 When Dennis arrived in Ceüzette I wanted to grab my bag (the one which had my sleeping stuff). But it was not there anymore. I was surprised. I put it just under the climbing rock, and it wasn't there. How could it be gone? How could it be gone? Meanwhile it was already after 20h and we were hungry. I almost forgot my climbing bag on the back of the car when we drove away. Because all I had was gone... My sleepingbag, mat, stove, food, clothes... Basically all except my rope, draws, climbing shoes, chalkbag and luckily my passport, phone and wallet were also in my climbing bag! How, how, who, what... did this really happen? Did someone really get his sick mind into stealing the things that are most essential to life: food and sleeping materials?! Did this really happen just now? I don't want to say I'm a tramp, but would you ever think of stealing the sleepingbag of someone living on the street?! The next day after a horrible night (we had no water, just one little mat and one sleepingbag to share and it even rained...) I started the search again. I hung up notes everywhere. On the parking, on the campsite, in the gîte. Just hoping to find back my stuff. After a search, asking everyone and notes everywhere we gave up. Then we met Michel en Leonoor! They spotted us when we visited the casmpsite. So surprised to find them here! They were so kind to invite us for dinner that evening. We went up to Céüse to get back my draws. Were told to go the the police office in La Saulce to put in a declaration. I was still hoping they found the bag there. The next day the office was closed. That Sunday I had to get back to the Netherlands as I had to work again. Yesterday I drove down through Germany to meet my parents. Met them in a hotel in Zülpich. A good thing, a thing to be proud of: they just started their journey to Rome. 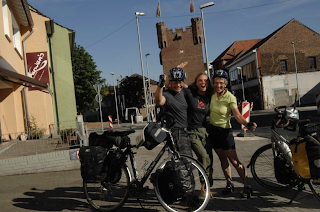 A cycling-pilgimage from the Netherlands to Rome! We chatted when I arrived in the middle of the night and had breakfast together. Really nice to meet them on their actual adventure and strange to say goodbye again. I wish them all the best on their big trip to Rome. Today I'm back in the Netherlands. Fixing all the last things before Dennis and I will head for Iceland. The stolen bag doesn't make things easier. It's Dennis last week in Crolles. Times went by so fast! He's been in France for half a year and now it's time for Dutch studies again.